Custom made LED board installed in stock housing. Jeff Dahle [JeffD on gstwin.com] has put together an LED circuit board for use as taillights and are available to the GStwin.com community for a small fee. The LED array Jeff chose is layed out on circuit board in circular pattern like the R6. 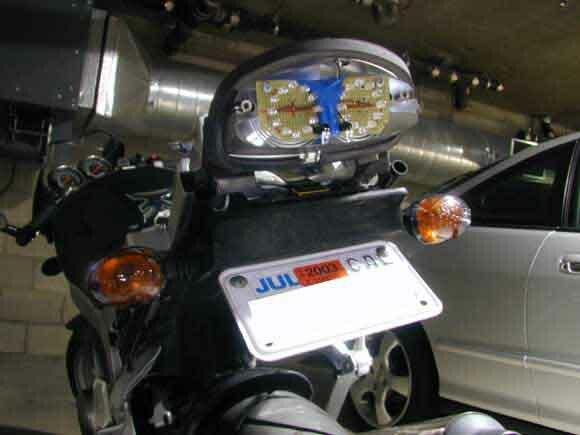 Two additional LED's are provided pointed down to light the license place. Their light color is more blue than stock bulbs, hard to photograph though. Jeff has 5 parallel circuits max running at ~ 20mA and is using 14v for his calculations (because thats the average charging voltage) so total draw is 100mA at 14 volts is a whopping 1.4 watts and I believe the standard bulbs run at like 20watts each. The LED's are red and two clear for the license plate. 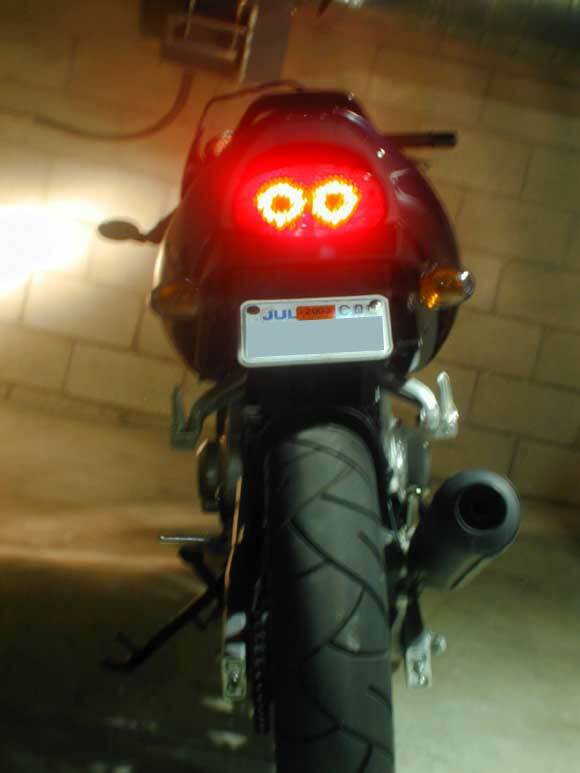 1) Remove taillight lens and bulbs. On 2001+ models remove rear bodywork to get access to the wiring at the bulb socket. On 2000 and older models you can twist the socket out the back when you remove the bulb. 2) On 2001+ models you'll have to drill a hole in the housing to run the wires. Do this so you don't have to remove the sockets which are permanently installed in housing. 2000 and older you can just remove one bulb socket. 3) Place circuit board where you want it. The LED's were layed out so the circles of LED's are centered where the bulbs are. There are two screws that will hold the board in place. Screw these through the board and into the tailight housing. Housing is soft plastic so you won't have to predrill, just push heavily on end of screw and turn to get it started (you can make life really easy by predrilling a small hole). 4) Run wires back and splice into existing socket wiring. Black to Black/White, White to Brown, Red to White/Black. Splice into existing wires so that you can always return it to stock lighting if you want. I used Quick-Splice connectors which allow you to splice without cutting the wires; simply lay the wires in the connector, squeeze the small metal plate to crimp the wires (and simultaneously splice them), then lock in place. 5) Turn ignition on and test lighting. you'll have to adjust the license plate LED's so they light up the plate correctly and sit high enough to not be hit by lens when you install it. 6) Install taillight lens and rear bodywork if previously removed. 7) Stand back and enjoy. Total time about 30-60 minutes. 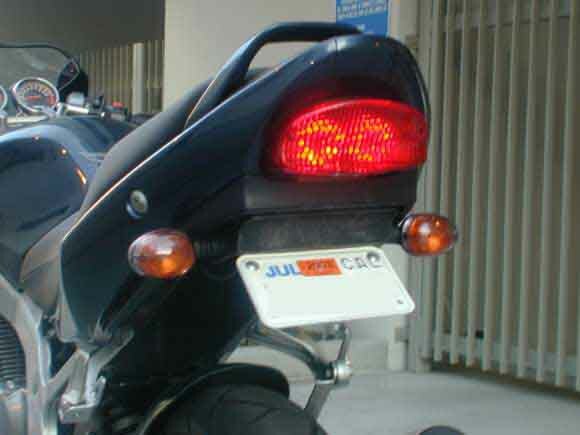 Taillight on [no brakes] with engine off. Photo doesn't do the light output justice. Special thanks goes to JeffD from gstwin.com for putting together the LED assembly and offering it up to the forum group.